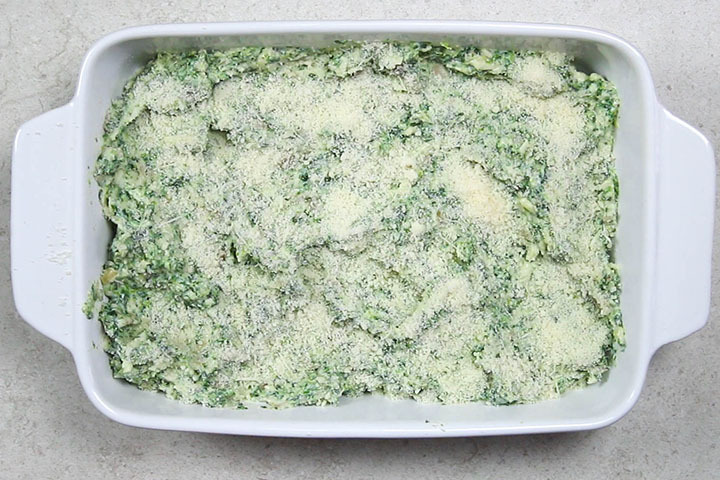 Keep this recipe for Hot Eggplant and Spinach Dip and serve it up with some crusty bread! It's perfect for parties or game day gatherings. 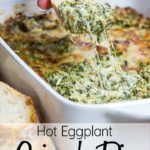 This creamy and decadent recipe for Hot Eggplant and Spinach Dip is an easy, delicious and super cheesy dip! Perfect for a game day appetizer. 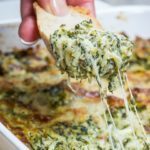 I don’t know about you, but when I see Spinach Dip on a party food spread, I get excited and when it’s hot dip – even better! 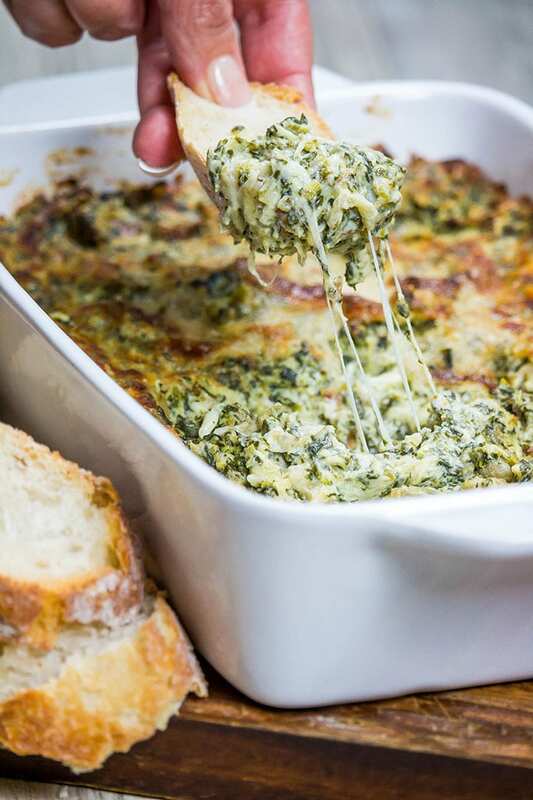 Ya know what makes spinach dip even better? Eggplant! Eggplant is great for making dips. 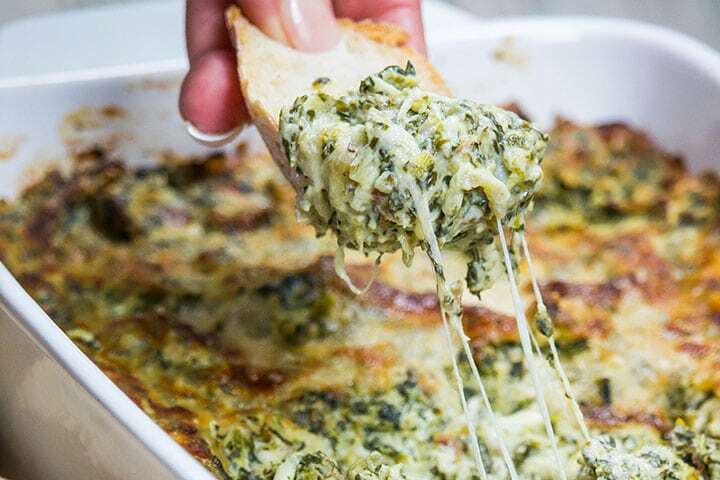 It may seem like a new thing to you, but I promise once you’ve tried it, it will be the only spinach dip you’ll ever want to make. Roasting the eggplant in halves makes it super simple to prepare. 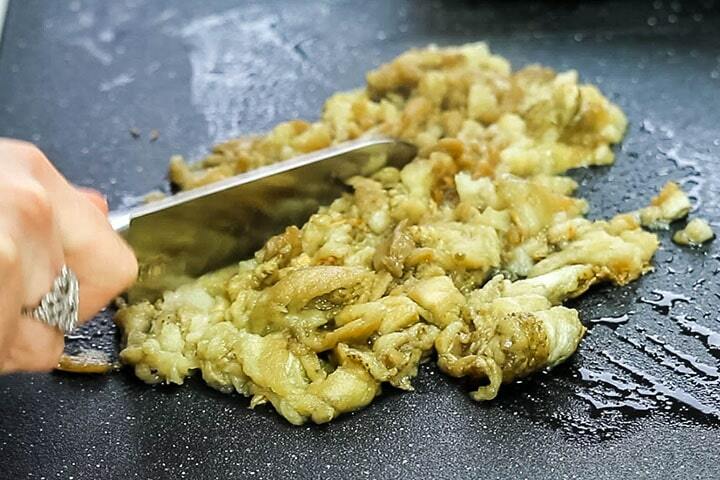 Cooking the eggplant without oil keeps it from becoming saturated and greasy. Using frozen spinach keeps the workload down. 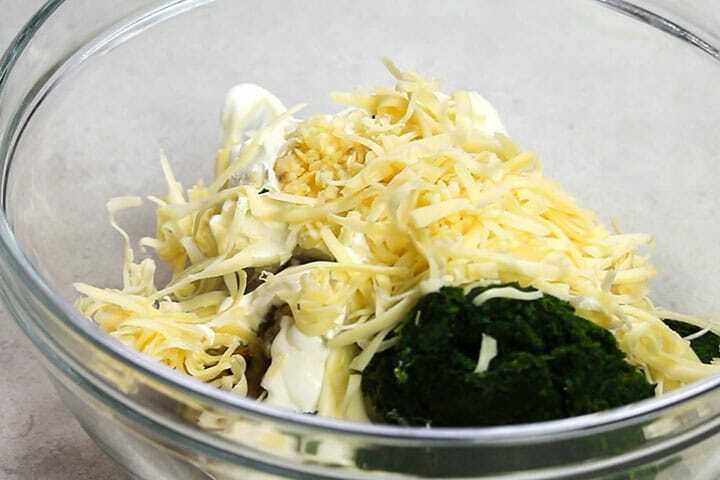 The use of different cheeses, as well as cream cheese, gives the dish a flavorful creamy texture. 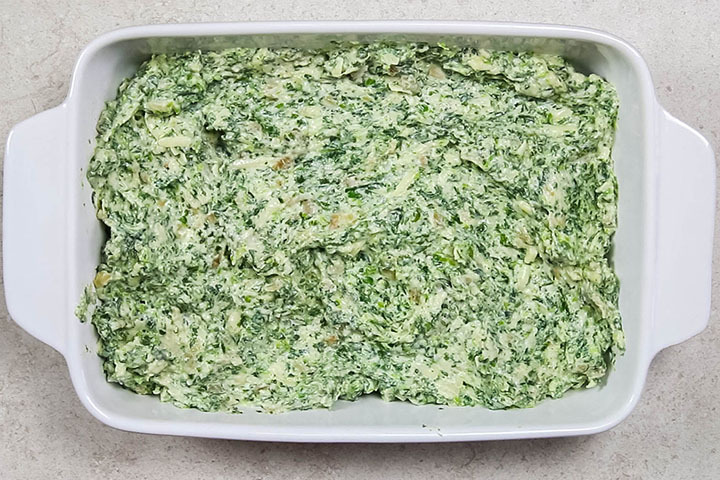 How Do you Make Spinach Dip with Cream Cheese? I’m here to make things as easy as possible for you. Below are loads of tips, a photo tutorial of the recipe as well as a video to make sure you have everything you need. One of the top common questions I get about party food is whether or not you can make it ahead. Let’s face it, planning a party is never simple. There are a million things to do to prepare, so I totally get why you’d want to do it! For this dip, the answer is yes! In fact, you can freeze it before or after baking! To Freeze Eggplant and Spinach Dip: Add it to a freezer safe container with a sealable lid, cover and freeze for up to three months. To defrost the dip, let it thaw in the refrigerator overnight. When ready use it, follow the regular recipe instructions for baking the dip. 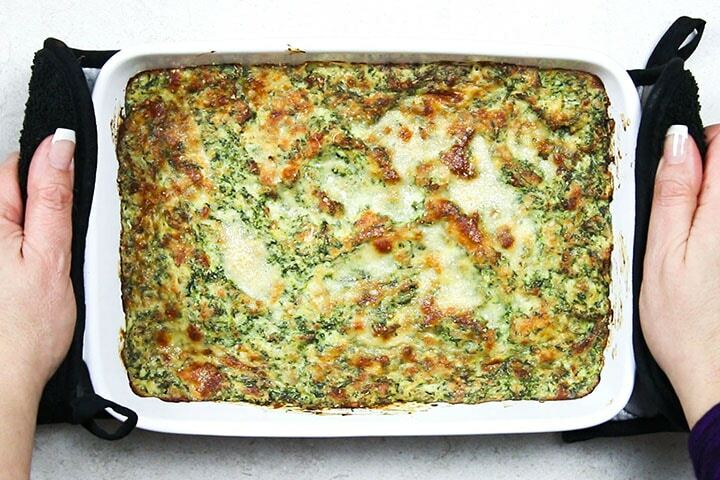 How Long Will Homemade Spinach Dip Last? 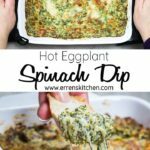 Eggplant Spinach Dip will last in the fridge for up to 3 days. Just prepare it up to just before adding it to the pan in the instructions. Add it to an airtight container with a sealable lid, cover, and store in the fridge for up to three days. When ready to serve, follow the regular recipe instructions for baking. How Long Can You Leave Out Party Food? Whenever you serve a dish like a party dip, you should always keep track of how long it stays at room temperature. For most foods, the general rule is that food should not be left at room temperature for more than two hours. Roast for 30-35 minutes (you’ll know they’re done when the skin shrivels). When ready, carefully scoop out the fleshy center with a spoon and run a knife through it to chop well. 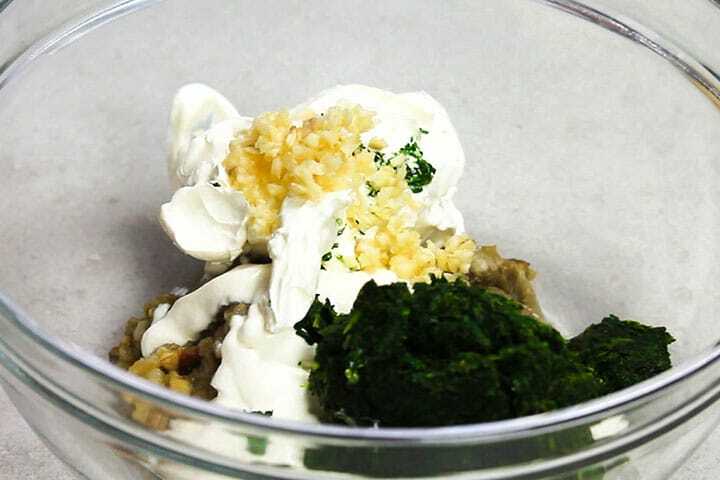 Place in a mixing bowl and add the sour cream, cream cheese, spinach, and garlic. Place in an oven-proof dish. Sprinkle with the grated parmesan cheese. Bake for 20-25 minutes, until hot and the cheese is golden brown. Serve hot. Serve hot with crusty bread or tortilla chips. Line your pan for roasting the eggplant with nonstick foil to prevent it from getting stuck to the pan. Not a fan of all the cheeses in the recipe? Swap them out for easy melting cheeses of your choice. 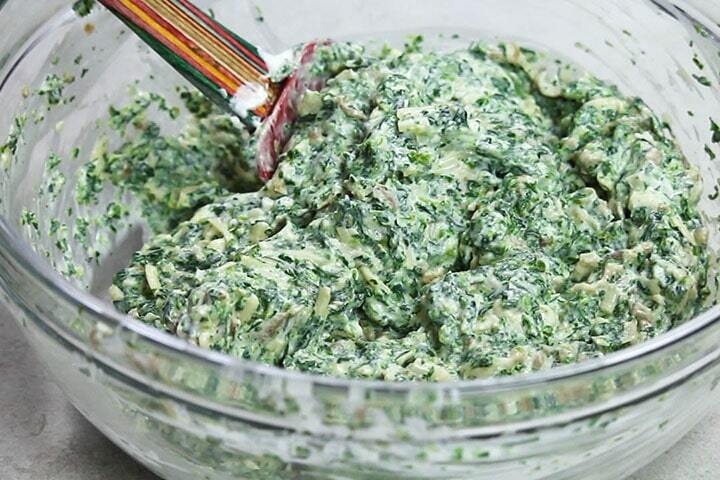 Use Fresh Chopped Spinach in place of frozen if you prefer. I do it by chopping baby spinach in batches in a food processor. Join the free Erren's Kitchen mailing list & get the latest tasty goodness straight to your inbox! ★ Did you make this recipe? Please give it a star rating below! 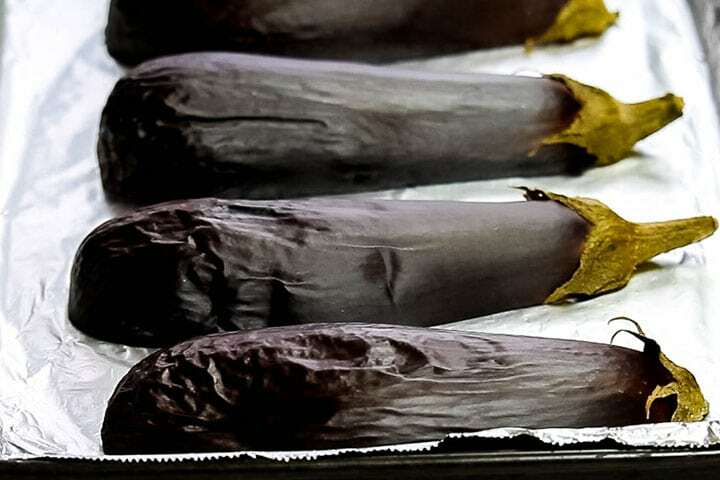 Place the eggplant halves face down on a baking sheet. and roast for 30-35 minutes (you’ll know they’re done when the skin shrivels). When ready, carefully scoop out the fleshy center with a spoon and run a knife through it to chop well. Place in a mixing bowl. Add all of the ingredients, but the parmesan cheese to the bowl and mix well. Place in an oven-proof dish and sprinkle with the grated parmesan. Bake for 20-25 minutes, until hot and cheese golden brown. Serve hot. I know for sure this would be a huge hit in my house! Love this idea for dip with eggplant. Looks amazing! This looks so yummy! Love how creamy it is! OMG!! This looks absolutely amaaaazing!!! I could eat the whole thing!! Katerina, I think I nearly have!! That dip looks amazing! This is a good idea and amazing recipe too. Something very unique and colorful. Need to try it out. Thank you, Chrissie, for your feedback! It is so morish too! I was the Guinea pig to test this, This dip is delicious and highly addictive! I’ve never gone through so many crackers, would be really good with celery sticks and cucumbers! Looking orward to making this over the weekend! I’m glad you enjoyed it Jade!